A1 Services Oxford is the new name for A1 Plumbing and Heating Oxford. We are highly experienced in all plumbing, heating, boilers, plumbing and bathrooms. To add to this, we are Gas Safe registered. Got a leak? Has your boiler broken down? Do you require professional gas fitters in the Oxfordshire area? If you do, then you really don’t need to look any further than the team here at A1 Services Oxford. Our plumbing and heating company has been established since 1967, offering professional gas fitting, plumbing services, boiler installations and central heating installations throughout the Oxford area. All of our team take a great deal of pride in providing a personal service. 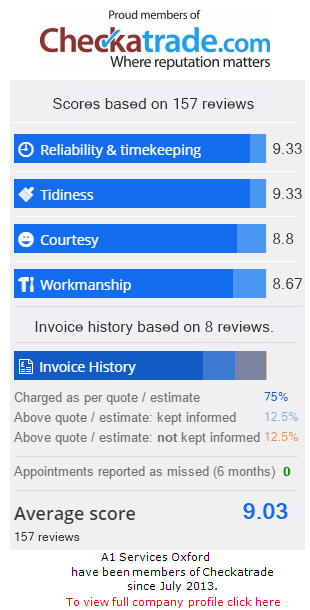 Furthermore, they believe in putting each of our customers first as every single job is important to us! We have built up a fantastic reputation over the years by providing a professional and friendly service that delivers on time. Each plumbing or heating installation job is tailored to every individual customer’s budget requirements. You will be pleased to know that we can also design and install kitchens and bathrooms, with no job being too big or small for us to handle. Our gas engineers can offer you a 2-hour time slot, whether it’s general plumbing, boiler repairs or heating maintenance. Your boiler should be serviced at least once every 12 months. Not only does this prevent the boiler breaking down but can make your boiler more energy efficient, in turn keeping your energy bills as low as possible. If your boiler has broken down and stopped working, give us a call as soon as possible and we will be able to identify and fix the problem in no time at all. Our team of skilled Gas Safe Engineers have worked on all kinds of boilers including gas, oil, LPG and even electrical systems. Leave it to the experts and call A1 Services Oxford today. Whether your central heating system requires replacing or a brand new system needs installing from scratch, A1 can provide all of the essential parts and equipment to ensure you are kept warm and cosy all year round. Our company is ideally located in Oxford and can travel to many of the surrounding areas such as: Witney, Bicester, Thame, Aylesbury, Abingdon, Wantage, Wallingford and Didcot. We are the complete plumbing and heating package. From design, supply and installation, we can take care of it all. We can also carry out all types of upgrading and modernisation to properties throughout the Oxfordshire area. Whatever your taste we can help you create a fabulous new bathroom. Please call us on 01235 812999 if you would like to find out more. Call A1 Services Oxford today on 01235 812999 to find out more! Our plumbers offer a complete plumbing, heating and bathroom service with competitive rates. Moreover, we can provide plumbing and heating requirements on any scale, large or small. We are proud of our high-quality workmanship. All our staff are loyal, hardworking, highly motivated, with extensive experience and skill plumbing and heating. They are an integral part of our success. Many of our team (and customers!) have been with us for several years. Your home and surroundings will always be treated with respect and the utmost care is taken to leave your property as we have found it. You may have a leaky tap, need a boiler service, or are looking for inspiration to create your beautiful new bathroom. Perhaps you are seeking advice on a new eco-friendly boiler/heating system installation that uses the latest technology to help you dramatically reduce your fuel bills and help the environment. Whatever you need, contact us and we will be more than happy to assist you. All our work comes with a minimum of 12-month guarantee. Manufacturer’s warranties are longer, so please ask us for further details. Our company is fully insured and we are members of Gas Safe & Oftec. As Oxfordshire’s local plumbing, heating and gas specialists, our customers benefit from our comprehensive range of services listed below. Drawing on our years of experience, we work with you to identify and meet your needs, as well as solve any problems. Nest Smart Internet thermostat control for any new or existing heating system or boiler. Meet the Nest Learning Thermostat. The new Nest Thermostat learns what you like and creates a schedule for your home. As a result, it helps you save energy. Also, with a larger display and a sharper resolution, it’s simply beautiful. Solar thermal systems use the sun’s warmth to heat some of your hot water. All our work comes with a full 12 month guarantee. Manufacturer’s warranties may be longer, so please ask us for further details. A1 Services Oxford has built an excellent reputation for providing high-quality property maintenance and repair services in and around Oxfordshire, including Thame, Didcot, Wantage, Bicester, Witney and Abingdon. Based in Oxford, we offer a full range of products and services. We work with our customers in all these localities to ensure that no matter how big or small your requirements we are able to provide a solution. Members of our highly skilled maintenance team pride themselves on their professional and reliable approach. Additionally, we aim to ensure that every customer is 100% satisfied with our services. To discuss any quote or job in more detail please call 01865 327732 for more information. – Customer in Aylesbury 12 June 2017New boiler and shower installation. – Customer in Aylesbury 12 May 2017Fit water heater and fit auto bypass. - Customer in Wantage 5th Jan 2018New house fitted to washing machine.